Today I’d like to catch you up on what’s been happening at End Game Games with Ragnaroll over the past 6 months or so. I’d like to start with a little apology to anyone who’s a date from me in the past. Development with Ragnaroll has been ongoing but real life has thrown in an unexpected interruption over the past couple months. I’m back on track now and can commit to staying on that track through the upcoming Kickstarter and beyond. Before I get into the changes, if you want to know what Ragnaroll is looking and playing like right now, check out the revised rule book. The graphic design is still a little rough but it’ll give you a great game overview. If you’ve got any comments or feedback on the rule book, please send them on through! We’re also at a stage where we can start sharing art from our fantastic artist, Ruk Trumata. 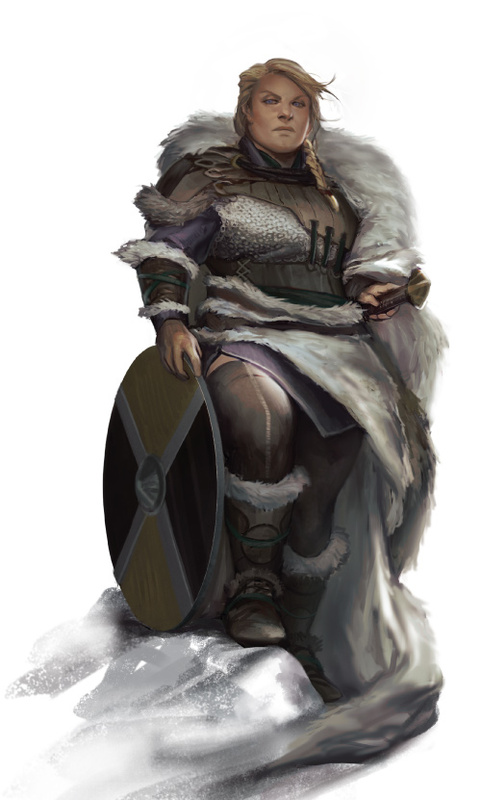 Here’s one of our first heroes, Hilda Shieldmother. You’ll be able to sneak a look at more heroes in the rule book. Yes, we’re updating the name to add in an extra L, we’ve had a lot of reactions to the name, including a personal message from a confused Swede, and decided to kick subtlety in the guts and go full roll. I’ve got some very focussed feedback on the brutality of Ragnaroll, and a lot of the recent development has been centred on easing players into Ragnaroll’s realm of death and glory. The narrative arc for Ragnaroll is relatively unique, as players don’t build engines or acquire territory, they struggle for survival. I’ve added a few additions here and there that reinforce the story, as well as rounded a few of the sharper corners in the game. The game now offers varying levels of mayhem, through Fate and Victory condition cards, allowing players to start with a simple game of survival and progress to a more epic game that better represents the Norse apocalypse. One of the subtler things I’ve been iterating on is the dice themselves, focussing on creating a spread of results that places an equal emphasis on luck and cunning. The soldier Viking has been replaced by a less reliable but more fierce berserker, pushing the game towards more dynamic battles. Your hero, in addition to a general tweaking of abilities, has also undergone a physical upgrade; she now has an even better spread of results, including a new murderous dagger result (you’ll need to check out the rule book for full details). There’s also been several minor changes, driven by the desire to make the game as lean and mean as possible. With over 2 years of development, there’s been some unnecessary vestigial elements that have finally met their rather timely end. But the end is in sight. Through feedback and iteration, Ragnaroll has gotten better and better, and I can say without a doubt that the latest version is the best and most stable Ragnaroll ever. Right now I’m in the process of getting together preview prototypes and have set a launch date for mid September, this isn’t quite set in stone, as there’s lots to do between now and then, but I’ll say it’s forged in steel. It might bend but it won’t break, you’ll see Ragnaroll on Kickstarter before Christmas. Pretty excited by this. Played it a year ago and liked it then. Can’t wait to see how its evolved! The art is a big improvement too. I seem to recall you pushing in the direction of multiple Ls! Can’t wait for the update, I have some friends pushing for table top action.